My role model is a paroled prisoner, an unrepentant killer. He is one of the reasons I root for the underdog – personally and when I was a reporter. The politics and social injustice that existed when the book was written have changed. But the book still resonates 75 years after its publication on April 14, 1939. 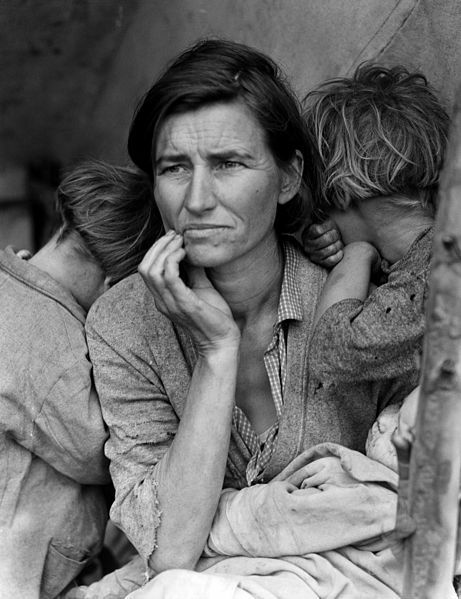 Like many families in the 1930s, during the Great Depression, the Joads are forced to leave Oklahoma. A drought turns their land into a “Dust Bowl” and renders it useless to grow crops and to make a living. Landowners and banks evicted tenant farmers. Some homes are torn down by tractors, leaving residents with nowhere to go. They’re told that there are jobs in California. Before they can get to the Promised Land, they are taken advantage of by crooked car salesmen and dishonest pawnbrokers when they try to sell their belongings to pay for transportation and for their trip. Defeated, they pack what possessions they can and drive down Route 66 in rickety cars and trucks to California where they – and thousands of others – head to migrant camps in search of work. Life on the road is hard and fraught with danger. The Joads and others are treated with hostility because so many Okies are flooding into California and there’s not enough work for them. Some are starving. Ma Joad, the family’s strength, believes that helping others will be rewarded. While there is greed, she has also witnessed kindness from strangers. She repays that by feeding some of the starving migrant children at the camp. Early on, Tom Joad and Jim Casy, a family friend and ex-preacher, begin to wonder why the tenant farmers aren’t organizing a union to fight the injustices of poverty wages and harsh treatment at migrant camps. They’re told that if they do organize a protest that they will be black-listed from the camps. That means they’ll never find work. When the Joads settle in at the Weedpatch camp, a government-sponsored place, it appears their luck has changed for the better. But trouble still follows them. A Farmers’ Association plans to sabotage the camp. They fear that the Okies are a threat to their way of life. Work is again hard to find. The migrant workers are paid far less than promised and it’s not enough to feed their families. Casy urges them to strike. Their protest is met with violence and motivates Tom to work for the community’s good. He’s on the run. Ma Joad fears she won’t see him again. Before they part, Tom comforts her and vows to continue to fight injustice wherever he finds it. My colleagues at the Observer Dispatch in Utica, New York, paraphrased that quote to reflect on my career at the paper. It’s a comparison I’ll cherish always. What an everlasting message, Judy. Thank you for the Steinbeckian reminder. A real classic. You’re right, Mark. The message is as true today as it was then. I haven’t read “The Red Pony.” Will have to check it out. Thanks for your comments, Robin. I was looking for the paraphrase–thanks for posting it. What a tribute to you! I think there’s a tendency today to, in the name of “tolerance,” overlook and even excuse injustice. These things cycle, I know, and I’m feeling a rising power that is something like the optimism of the 1960’s, the sense that somebody has to (we just have to) make the stories known! Sounds a horrific story, I can’t imagine what it must have been like to live under circumstances like that! I’ve heard of The Grapes Of Wrath but not as a film, and I’d forgotten that it was a John Steinbeck novel. I’ve yet to read his books, he’s on my wish list, because I’ve taken a look at some of his novels and I really love his style, he has an excellent way of describing the characters, they really come alive – I like that in a novel. From my Mom’s stories about the Great Depression, it was hard times for many folks. But it seems it was especially hard on farmers who were uprooted and desperate to find work to feed their families. My Grammy was part Irish and I also heard about the Potato Famine in Ireland. Definitely a lot of suffering there, too. Yes, we are far luckier today. The photo in your introduction is very familiar as is the novel by Steinbeck. I remember team-teaching a unit on this period with a history professor, pairing literature with the events of the Depression-era. As always, a great message. 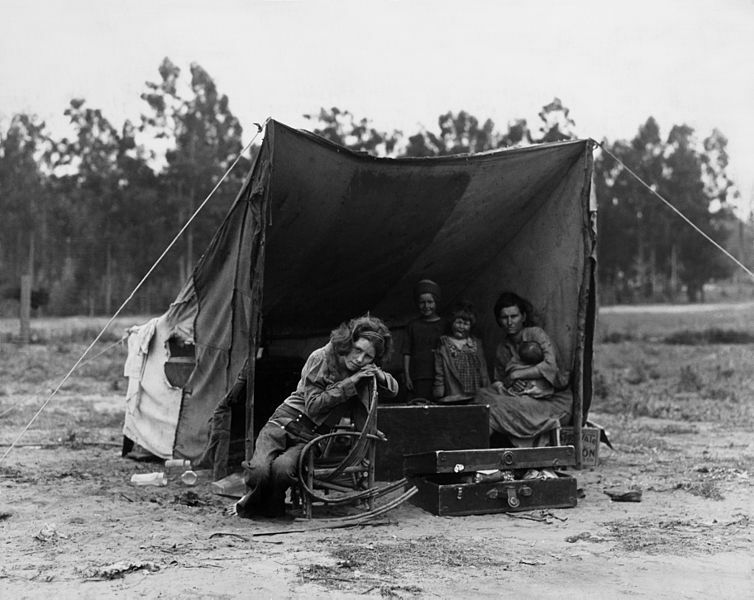 John Steinbeck produced “The Harvest Gypsies” articles that included photos of migrants taken by Dorothea Lange from Oct. 5 to 12, 1936. Whether they ever met, I do not know. But their impact was significant in shining a spotlight on what was happening to migrant workers. Team teaching this with a history professor had to be an excellent experience. I’m glad you liked the story. 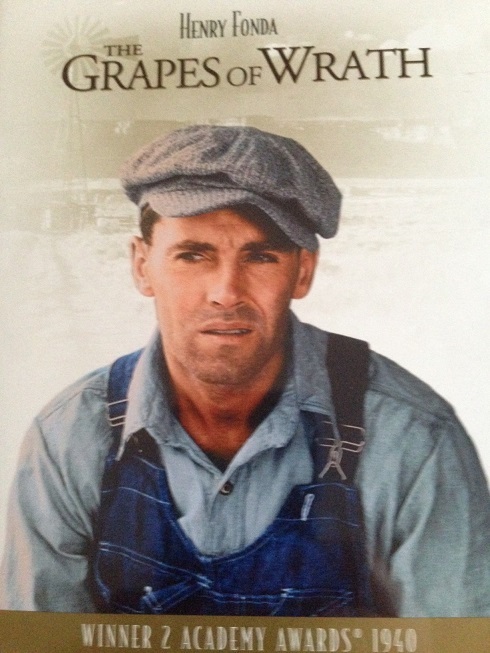 My “other” Steinbeck role model is George in OF MICE AND MEN. I’m embarrassed to admit that my first college semester as an English major, I had never heard of or read anything by John Steinbeck. In southeast KS his books had been banned from the school curriculum. I didn’t admit this to my college professor or any students; I went to the college library and began reading all of Steinbeck’s books, one by one, secretly, in addition to all my other course work. To this day, Steinbeck’s writings are at the top of my list. Why were his books banned in Kansas? I know that some felt he portrayed the migrant workers in a negative light. I do think that Steinbeck gave the migrant workers dignity and tried to do the same with his other characters as well. When I think of Lennie in “Of Mice and Men,” I have to think of the parodies done by Bugs Bunny (Warner Brothers) and many others. I’m glad you enjoy his writings as I do as well. Keep rooting for the underdog, Judy. And please keep writing. To have that as a going away thought as you were leaving must have been satisfying, yet maybe it made you feel sorry to be leaving? That first photograph is a favorite of mine. I think it sums up the time period but also could speak to many of other times of suffering. Amy, I did have mixed emotions when I was leaving. They were a great group. That photo really does portray the sadness and desperation that folks felt then. She looks so much older than 32. Worried about her young uns. That would do it for me, too. Powerful, timeless with so many lessons to teach today. I hope to watch this soon. People nowadays easily forget the hardships and struggles of old in search for a better life, of a promised land till today so many are looking for. Sad that in reality there are people out there without conscience and will take advantage of others who are helpless, trusting and naive. Someone I knew the feeling of having your dream torn away from you. To realize not all who offer their help have you in their best interest. I learned the hard way when I first ventured in California 11 years ago. Take care my friend. All the best! I didn’t know it was a movie! I’ll have to check it out. It’s an excellent movie, Lisa. Terrific performances by: Henry Fonda (Tom Joad), John Carradine (Casy – movie reference spells this as ‘Casey’), Jane Darwell (Ma Joad). The movie was nominated for seven Academy Awards – and won two of them: Best Director Oscar and Best Supporting Actress to Jane Darwell as Ma Joad.